A legendary artist with killer runs on Spider-Man, Punisher and X-Men will reportedly be drawing the Man of Steel this year. According to comic-book rumor site Bleeding Cool, DC Comics' flagship superhero will be getting a new interpretation from John Romita, Jr., the second-generation creator whose family name is synonymous with rival publisher Marvel. Romita is supposedly joining DC Comics chief creative officer/star writer Geoff Johns, who appears to have cleared the decks to start in on a new run on Superman. Romita's only drawn Superman one time before, on the cover of a collection of old-school DC/Marvel crossovers. The drawing above hews closely to the ceremonial Krytonian armor style that Kal-El's been sporting ever since the New 52 relaunch, with the plating looking more raised and three-dimensional. A formal announcement of the new creative pairing is expected later today on DC's YouTube channel. Johns' output for the New 52 has been a mixed bag, for me, mostly standard fare in the trauma-driven, dour-superdude paradigm that he helped cement in the late 1990s. I've liked his writing on Superman in the past, though, particularly in his run on Action Comics with Gary Frank and Andy Kubert on art. 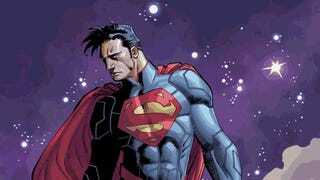 Here's hoping that the Johns/Romita run is a return to the brightly-inflected Superman seen in that interpretation.